Each year at a local neighbourhood park, Jane helped by people from the Casa, creates a memorial for Oaxacans who have died in the US. A candle was lit for each of the 157 Oaxacan people who died in the USA during 2013 “in search of the American Dream”. At midnight we travelled to, another nearby town, Atzumpa, where the cemetery is situated on a hill overlooking the small town. If we were confronted before, we were shocked by what awaited us here. It was sensory overload. We were assuaged by the smell of marigolds and copal incense, by the colours and candle-lights, by the chaos of the crowd and the very loud carousing band on the brightly lit stage. There was a seething mass of people. We made our way between graves marked out by candles. There were no paths. We were worried about intruding on people’s private moments of reverie, physically falling onto a grave and our clothes going up in flames. A couple sat quietly beside a grave, often just a simple earth mound covered with flowers. Family groups lit fires and cooked food. Older people sat a solitary vigil. Children bedded down for the night. Young people texted and tourists gawked. We felt more intrusive here, perhaps because it felt more private and less structured. It was as if we were crossing a boundary, stepping into people’s personal space. This was a much poorer area, the graves were less demarcated, less concrete, less showy decorations, and we wondered whether more people were awaiting the return of loved ones. We were aware of the struggle that communities like Atzumpa and Xoxocotlan have in interesting young people in maintaining the Day of the Dead traditions. The introduction of live music is part of the local government trying to engage and entertain. We hoped it wasn’t just for tourists. These Day of the Dead traditions are vigorously marketed to tourists like us as “authentic”. Tourism in turn brings economic benefit and there is value added to the maintenance of traditions. At 9 pm on the night of the 31st October when we approached the Nuevo Panteon cemetery in Xoxocotlan, outside Oaxaca city we encountered huge crowds, a stage with large video screens displaying traditional dancing and music. We thought we were at a pop concert. In the beginning it was hard to tell who were tourists and who weren’t. Once inside the cemetery the separation became clear. We were the awkward awe struck ones stumbling around in the dark with cameras. We both had a heightened sense of being observers into what was private family business. At the same time, this was a very public and community event. This was exactly the culmination of what we had come here for. 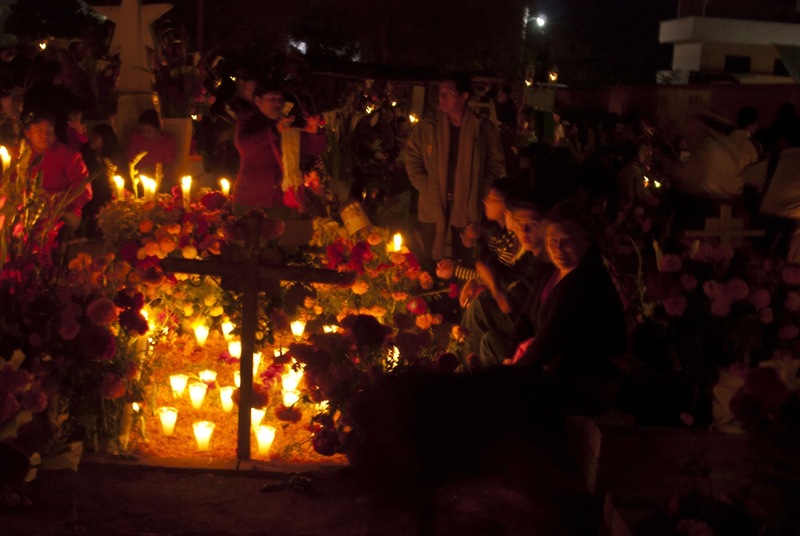 The evening at the Xoxo cemetery is the high point of the Day of the Dead package as promoted by regional tourism. It is impossible not to be aware of this. But our experience was much more than this. We were expecting eating and drinking and dancing. Away from the entrance it was quiet. Yes there were strolling mariachi bands and and as the night wore on there may have been more alcohol consumed, but this was not a party. It was a respectful night-long vigil. Family groups gathered around the grave. Children played with the decorations. Young adults showed off their skeleton makeup. But there were also solitary people in a more reflective space. As an observer it was impossible to know if people were quiet or sad, waiting for family to arrive or for the dead to return or in their private reverie or conversing with the dead. Some graves suggested wealth with their extensive gravestones, expensive flowers, decorations and candles. Some had sandpaintings on the grave and fencing to demarcate a family plot. Some gravesites were very Catholic while others not. Even though we were uncomfortable as outsiders it was a very moving experience. We reflected on the distance we put between ourselves and those we know who have died. Culturally we value separation from the dead rather than connection. We encourage ‘letting go’ those who have died rather than welcoming them back into our lives. When we visit a memorial or cemetery we don’t linger. We like to keep the boundary clear between the living and the dead. As we left Xoxo at midnight, more and more people were arriving and the atmosphere was becoming louder and perhaps more festive. Far from the stillness and solemnity we associate with death.